In Norse mythology, Odin (Old Norse: Óðinn) is the god of wisdom, poetry, war, death, divination and magic. Son of Bor and the giantess (jötunn) Bestla, Odin is the chief of the Æsir and the king of Asgard. He is married to the goddess Frigg, and is the father of the gods Thor, Baldr, Höðr, Víðarr and Váli. Known as the All-Father, Odin is often accompanied by two ravens, Huginn and Muninn, along with the wolves Geri and Freki; the god rides into battle atop an eight-legged steed, Sleipnir, and wields the mighty spear Gungnir, which was fashioned for him by the dwarves known as the Sons of Ivaldi and is said to never miss its target. A defining feature of Odin is his' being one-eyed, a result of him having sacrificed an eye to drink from the Well of Urðr, which granted him an incomprehensible amount of knowledge of the universe. Odin himself often receives counsel from the severed head of the being Mímir, which recites secret knowledge to him. Half of the souls of those slain in battle will be guided by the Valkyries, battle maidens, to Valhalla, Odin's enormous and majestic hall: the other half go to Fólkvangr, Freyja's realm. 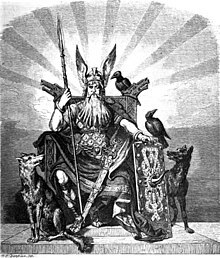 Odin was known in Old English as Wōden, in Old Saxon as Wōdan, and in Old High German as Wuotan or Wōtan, all of which stem from the reconstructed Proto-Germanic *wōđanaz. The modern English weekday name Wednesday bears the god’s name. (from Old English Wōdnesdæg, “Wōden’s day”). Odin is the son of Borr and the jötunn Bestla. He is married to the goddess Frigg, by whom he is the father of the twin gods Baldr and Höðr. With the giantesses Gríðr and Rindr, Odin has two other sons named Víðarr and Váli. His eldest son is Thor, god of thunder, born to him by Jörð, the personification of the Earth. Tinia - Etruscan mythology version of Odin. Jupiter - Roman mythology version of Odin. This page was last changed on 7 April 2019, at 08:44.